We manufacture Cold Rooms for Convenience Store. We installed cold rooms in the showrooms where fruits, vegetables or any other perishable items are required to be stored. It can be used to store other perishable products such as milk and milk products. 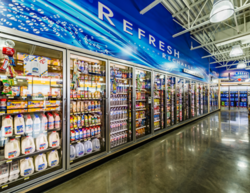 These cold rooms for super markets by National Refrigeration come in various sizes and technical specifications to suit various requirements of the clients. On other hand cold rooms manufactured by National Refrigeration can also be used in industries catering to wines, seeds, eggs, cut flowers and spices. Pack Houses and perishable cargo complexes also require cold rooms. Looking for Cold Rooms For Convenience Store ?